If you like double the romance (2 couples!!) and some cool fantasy elements, should you read this book? Molly Ringle is one of my fav authors, after just one series--her Chrysomelia series about a Hades and Persephone retelling. One an author gets on my fav list, I'm down to read pretty much anything that have to offer. After reading through some reviews on Goodreads, I was really surprised to see that some people weren't quite fans of The Goblins of Bellwater. The writing: I always feel that Ringle's writing is on point, and I loved the very ethereal style she used for this book. 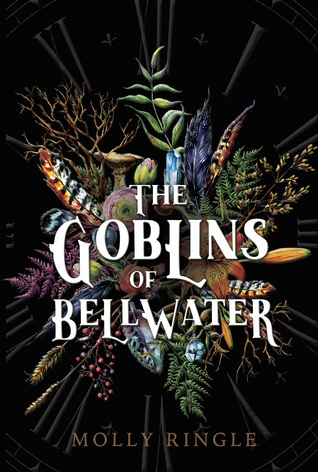 Goblins of Bellwater isn't your typical paranormal romance book–I'm not sure exactly how to describe it, but this didn't feel like a fantasy/paranormal book while I was reading it, even with the fantastical elements being the driving force of the book. This isn't a bad thing. As far as the characters went, I was much more interested in Kit and Livy than I was in Skye and Grady. I think this was because Skye and Grady's connection was so strong from the beginning, due to the spell Skye is under, that they didn't have a lot of room to grow. But Kit and Livy had an interesting relationship with some definite steamy moments, and it felt more genuine. One thing I can say for certain is that Molly Ringle is a pro at mythology, if this wasn't already evidence by how adeptly she tackled the mammoth that is Greek mythology in her other series. But the goblin mythology she created in this book is truly unique, even with a bit of a sad twist. I was thoroughly engrossed in the fae world she created, and really wanted more–remember when I said it didn't feel like a fantasy/paranormal book? It's because the more intense fantasy parts of the book came later on. I understand why, and it allowed much more character development to have the bulk of the story be the characters interacting with each other instead of directly interacting with the fantastical elements. Overall, I'd give this book 4 stars. You can purchase The Goblins of Bellwater for $0.99 as a Kindle copy, or $9.77 as a paperback copy. Molly Ringle was one of the quiet, weird kids in school, and is now one of the quiet, weird writers of the world. She likes thinking up innovative romantic obstacles and mixing them with topics like Greek mythology, ghost stories, fairy tales, or regular-world scandalous gossip. With her intense devotion to humor, she was proud to win the grand prize in the 2010 Bulwer-Lytton Fiction Contest with one (intentionally) terrible sentence. She's into mild rainy climates, gardens, '80s new wave music, chocolate, tea, and perfume (or really anything that smells good). She has lived in the Pacific Northwest most of her life, aside from grad school in California and one work-abroad season in Edinburgh in the 1990s. (She's also really into the U.K., though has a love/stress relationship with travel.) She currently lives in Seattle with her husband, kids, guinea pigs, and a lot of moss.